We stumbled upon the new St Regis in Rio Grande - it's only about 30 mins from San Juan airport by car (we rented a car for $100 for 4 days). 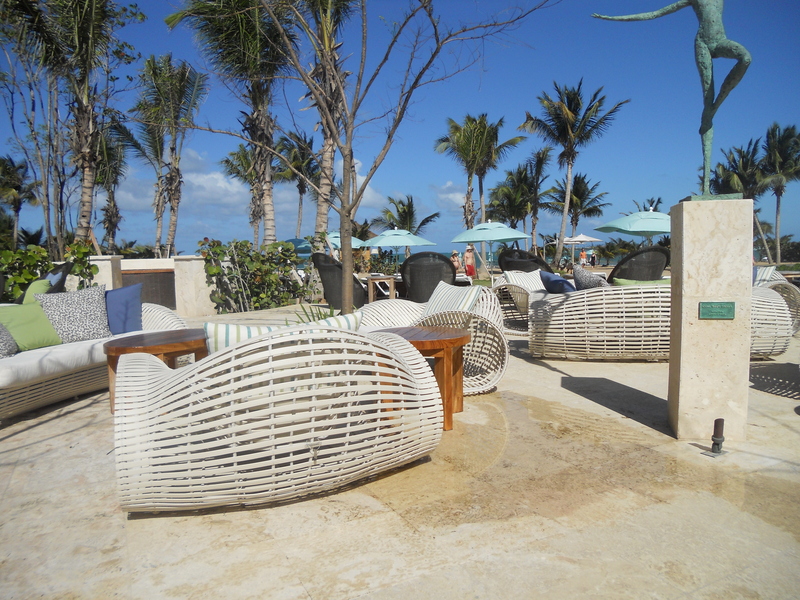 I had never really heard of St. Regis, even though I'm a tried & true Starwood Preferred Guest member - I guess I usually tend to focus on the Westin & W as they're more our style & price range. The St. Regis is SPG's top-of-the-line chain, with rack rates over $1000 a night! Ouch! The resort opened in Oct 2010, so was only open a few months and some of the early reviews on TripAdvisor weren't that flattering... but they had started to improve and responded to alot of the more recent posts. And you figured it couldn't survive at those rates with those kind of reviews... as it turned out, we were right! Fortunately, we also were able to mostly use SPG points (20K per night for $2000 of value), which is actually a pretty good utilization of points / miles if you compare to getting a free flight (typically around $350-500) for 40,000 points / miles. But this place is worth it - when we checked in, we were given champagne, and the butler is now coming over to our room to mix me a mojito and bring Lisa a chamomile tea! Why are we only staying here a few nights? Oh yeah, we went dry with our points! 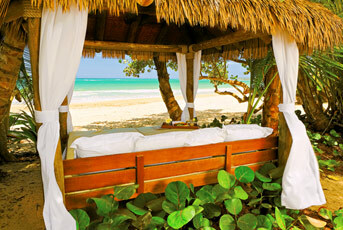 Beach palapas at St Regis - this will do for now... but pls come back in 5 mins to spritz me. Lisa for poolside lunch - Mahi Mahi with spicy mayo! Beach in the background - Most of the guests stayed by the crazy nice pool, but the beach is so close too! 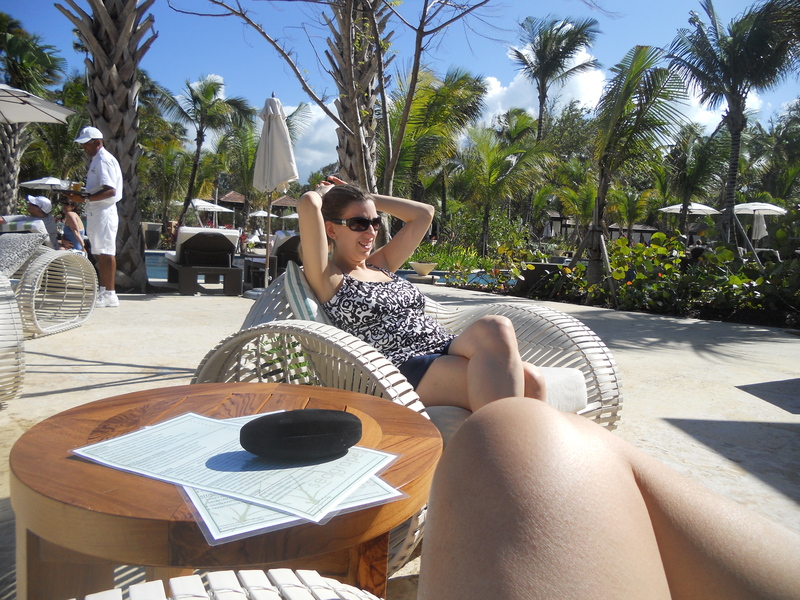 We’re halfway through Babymoon, 2011, and we’re having a wonderful time down here! 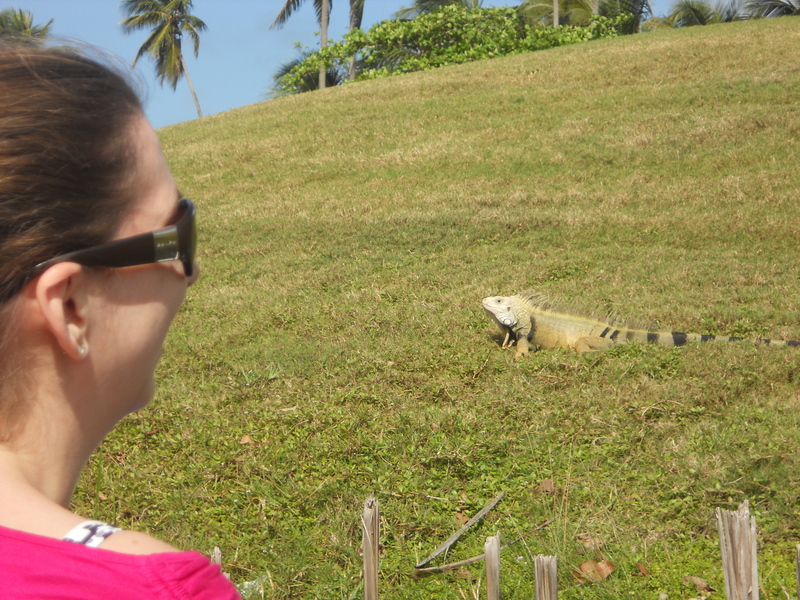 This morning, after a light breakfast on our balcony, we went kayaking for about an hour, where we saw lots of turtles/coconuts, iguanas (here Lizard, Lizard!) and golf holes. Richard was practically salivating watching the golfers out there, but the whole purpose of a babymoon is to spend time together, so he didn’t play (thanks Sweetie, I appreciate it!). 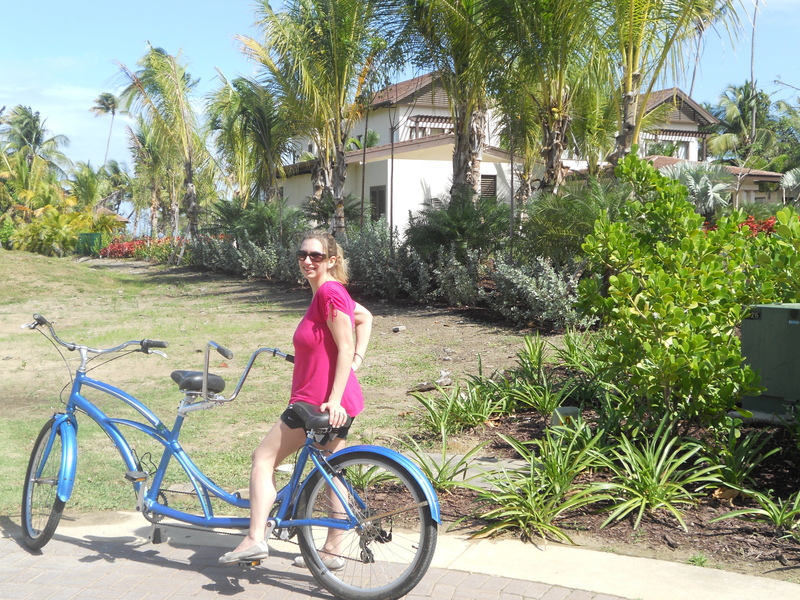 Then we got on a tandem bike, which I’ve learned is one of those things that looks more fun than it really is! Maybe it’s just cause I was in the bike and couldn’t see anything, plus I missed the feeling of freedom and adventure you get when the wind is whipping through your hair. The property isn’t that big, so we only biked for about 30 minutes. There are a couple famous people (Oscar de la Hoya, Carlos Beltran, J-Lo) with homes here, which we shamelessly took pictures of (see below). For food, we ate at Seagrapes (restaurant by the pool) and Molasses (by the golf club) once. All of them were pretty pricey ($20 sandwiches, $16 cocktails), but generally good. We never ate at Fern, which is their "fine dining" Jean George restaurant. We opted to use the car we rented to check out the "real" PR food. We had dinner at Pasta & Pueblo – which is supposedly one of the best restaurants in PR – run out of a shack by a few former surfers. It's technically in Luquillo, which is very much a beach area - it's teeny, so you may drive by it a few times before you actually recognize it (as we did!). We got the Coconut Shrimp and Flank Steak, which were fairly basic, but solid... nothing mind-blowing, just good fresh food. We loved the low-key beach bum atmosphere, where there were literally rocks on the floor. Also, I love their motto "Food made with love" and the fact that Beer ($1) costs less than Water ($1.25). We also ate at La Estacion, which is a super cool restaurant in Fajardo we stumbled upon last time we were in PR - it's a great carribean BBQ restaurant - all outdoors. Hit this up if you're doing the BioBay in nearby Fajardo. We started out with chorizos on a skewer, and a yummy green papaya salad - for our main courses, I had BBQ pork spare ribs and chicken - while Lisa had their famous Mofongo - which is mashed plantains stuffed with BBQ chicken. Everything was great - as last time - we will be back, oh yes, we will be back. Interestingly, the place always seems to have a lot of tourists which is odd since it's in a bit of an out of the way location. Oh well, we like it nonetheless! On our last day in PR, we hit up a strip mall of "Kioscos" or Kiosks in Luquillo. Very gritty (in a good way) - we hit up El Jefe Burger Shack - supposedly the best burger in PR. We'll be the judge of that! First impressions were good - I liked the atmosphere and it had a good mix of locals & tourists - this is the type of place that lets you write on the wall "Eggy was here!". Now, for the food - the waitress was really nice, but I think pretty disappointed when Lisa ordered her burger plain with American cheese and none of the fun condiments they offered (as I am every time she orders her boring burgers ; ). Fortunately, I came to save the day and got the sampler of sliders - one with short ribs, another with chorizo sausage, and lastly one with jalapenos... all sounded amazing and I was psyched when they finally came - 90 minutes later! Even our salad took about an hour.... we understand island-time - we really do... and in fact we weren't in any rush - but this was a bit ridiculous since the place wasn't super-crowded. Think they just need to expand the kitchen - as the grill is teeny! Sadly, the length of time overshadowed the food. My sliders sounded great in theory, but were too well done for my tastes. I could kind of taste the ingredients, but not enough to do them justice. I would give El Jefe another try - as I liked the place and hope that it was only an aberration... Lisa liked her burger, but nothing to write home about. Maybe its just that our standard for burgers is so high with our Cloudland meat ; ).